Lakeview East residents on Facebook's Taking Back Lakeview Neighbors group are reporting that catalytic converter thieves have returned to the area. Separately, a CWBChicago reader contacted us with information about how some of these teams cover up the noise generated by sawing metal parts off of cars. Start-to-finish, two offenders needed less than a minute to remove a catalytic converter from one SUV in a video posted to the Lakeview neighborhood watch group and Reddit this weekend. Video of the theft is published here with permission of the victim. An out-of-town crew whose work is posted on YouTube required 45 seconds to roll up on a car, saw off the converter, and start driving away. In the second video, the thieves conceal their activities by having the sawman do his work while hidden between the target vehicle and the get-away car. Some committed city residents will only park in spaces where the driver’s side is next to the curb. It’s not fool-proof, but it does make it a lot harder to access a catalytic converter. So, how do they cover up the sound of sawing through metal pipe? 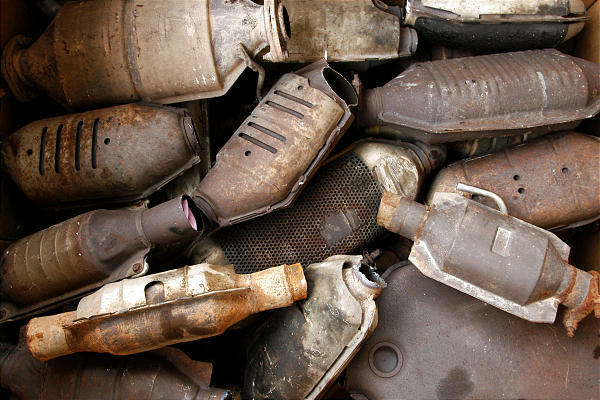 According to a CWBChicago reader who witnessed a catalytic converter theft in 2016, the answer is incredibly simple: They blast their car audio system. “The vehicle had an aftermarket sound system with the volume turn up very loud Then I heard them sawing the metal on the exhaust. This was at 5:43 am and I immediately called 911,” he said. The driver stood as lookout while the passenger did the sawing, he said. Our reader said he saw the crew hit three cars in six minutes before police arrived. So, that loud thumping music you hear briefly at night may be much more than a partier arriving home from a night on the town.